Diarrhoea is one of the biggest killers of children in Africa. Cheap and simple remedies can be effective, but only if they reach those in need. So one British couple came up with a way to solve this delivery dilemma - by using something that was already there. It is not really a main street, just a wide dusty red track between a scatter of huts and little stores that make up the village of Kanchele in southern Zambia. At one end there is a cluster of lively market stalls. At the other end, the men are playing pool. Hens and tiny chickens scratch the red earth. It is a long way off the main road from the Zambian capital Lusaka to Livingstone near the Victoria Falls, bumping down 30 miles (50km) of increasingly rough tracks across the bush. Eventually reached, the village is pretty basic; no power supply, water fetched on foot from the river two kilometres or so away. No television, of course. I came to this remote place in Africa with a British campaigner called Simon Berry, now in his fifties. I had met him for the first time in May, in rather different surroundings. It was a triumphant evening in London at the Design Museum, his small not-for-profit organisation called ColaLife had won one of the top awards. Simon Berry and his wife Jane had come up with a strikingly-simple idea - a package for medicine that slotted into the empty space at the top of a crate of soft drink bottles, fitting neatly in between the bottlenecks. A dazzling idea, to piggyback the delivery of the diarrhoea medicine for babies onto one of the most efficient distribution systems in the world. Go anywhere and you will find a shop selling Coca-Cola. And the plastic packaging is ingenious - once opened it becomes a measuring device. Clever stuff. The Berrys are not doctors, but they are people of conscience troubled by the stubborn incidence of child diarrhoea in Africa. It kills more children than HIV/Aids, Malaria and measles combined, largely because of bad water supplies. Most cases could be easily treated with a combination of zinc and rehydration salts costing pennies or cents. But the medicine needs to get to the babies. The cola crate brainwave seemed to have done the trick. The Berrys looked for partners. And then they started to have doubts. The Berrys are not commercial sorts of people, they have been involved in development projects. But when they took their brilliant idea to the Coca-Cola distributors they were asked a perplexing and commercial question that at first they did not really understand. "What is the value chain of your product?" said the soft drink people. It was a harsh business question for anyone schooled in the economics of aid. But what the soft drink experts wanted to know was; at which point in the distribution chain would the various people who took part in it be able to make a (small) profit out of their involvement? In other words, clever award-winning stuff with the packaging was only the start. To get the medicine delivered to every distant village the Berrys would need to do what the soft drink people did - make sure that anyone who handled each local bit of the distribution got a little bit of financial reward. Piggybacking on the crates was clever, but it was not enough. District clinics that serve rural Africa are not close enough to most villages to get the treatment into many mothers' hands - it is often a day's journey there and back when women need to work in the fields. So they take risks with infant diarrhoea. The Berrys realised that the profit motive could be the missing link. A small margin for the manufacturer, the distributors across Zambia to local bases, and then a profit for the shopkeepers who would sell the product to mothers, not give it away. It is this value chain that gets soft drinks into the remotest villages, and that is how the diarrhoea medicine is now being launched. It is called Kit Yamoyo, which means something like life in several African languages. There are radio adverts, volunteers to teach mothers how to use it, and thousands of vouchers have been distributed to give the scheme an initial push. And Simon Berry says he has learnt quite a lesson about effective healthcare action. Even poor people will pay for treatment that saves their babies - that is what they told me the other day. The ingenuity of the pack that fits round the necks of cola bottles is almost immaterial. 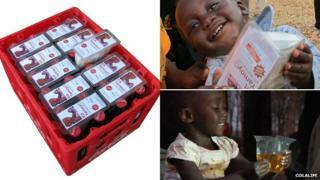 The medicine now goes out (using the soft drink distribution channels) packaged in conventional cardboard boxes. All of this makes the Design Awards festivities in London just a little bit irrelevant. But the Berrys have now got a powerful insight into getting medicines into the poorest villages in Africa. They have found out how to turn a chain of profit points into healthy babies. I saw it myself, in Kanchele.